THE SEMINAR WAS A GREAT SUCCESS. THANK YOU TO EVERYONE WHO CAME OUT FOR A WONDERFUL WEEKEND OF AMAZING TRAINING WITH DR. ZOUGHARI !!! 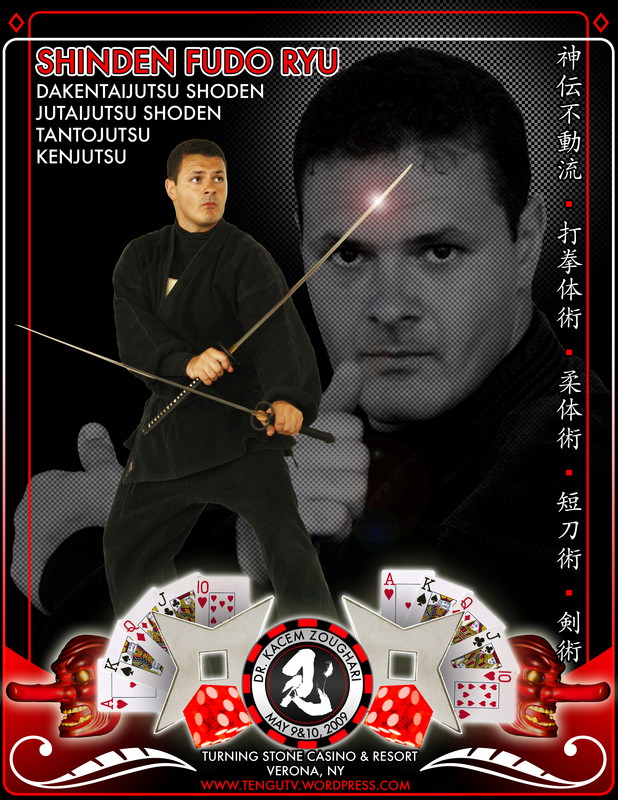 To use this poster for advertising in your dojo, click on it to enlarge. Then right click your mouse and save it to your computer. It is formatted to 8.5″ X 11″ at 300 dpi. Dr. Kacem Zoughari is a well known Japanese History and Martial Arts researcher and practitioner. Born in Paris, France he began studying Martial Arts as a teenager and quickly began visiting Japan to further his studies. He has practiced Ninjutsu for well over 20 years and is a personal student of Hatsumi Masaaki Soke and Ishizuka Tetsuji Sensei. Dr. Zoughari began his training in 1986 in France. In 1989 he made his first trip to Japan where he trained with Ishizuka Sensei. From that point on he began spending a few months of every year living and training in Japan. Over the ensuing years Kacem became a personal translator for Hatsumi Soke, acted as a translator for the Quest Video Company, and became a member of the Nihon Budo Gakkai (Japanese Martial Arts Research Organization). After writing a briliant thesis of more then 1000 pages, which involves complex topics related to Kata and knowledge transmission connected to social and cultural aspects of pre-Edo society in Japan, Kacem continues to train with Hatsumi Soke & Ishizuka Sensei and to travel the world giving lectures and seminars. He is preparing for 7 years in Japan as a university professor and also as a full time member of the Nihon Budo Gakkai. His work will continue researching and preserving the old wisdom of the ancient pre-Edo warrior schools (bujutsu & bugei ryuha). Kacem has put the finishing touches on his new Ninjutsu book and just completed writing a book about Iai (sword drawing methods). He is currently living with his family in Paris, France. PLEASE READ SEMINAR INFORMATION CAREFULLY! EQUIPMENT TO BRING: Bokken Katana (wood long sword), Bokken Kodachi (wood short sword), Wood Tanto (knife). All training gear MUST be carried in a bag or wrapped in a blanket or towel. ** PLEASE, NO LIVE BLADES WILL BE ALLOWED. PLEASE ARRIVE 30-45 MINUTES EARLY TO SIGN IN, CHANGE, AND STRETCH. HOTEL: The Inn: $99 per night / The Tower: $149 per night. An additional 8% tax is applied at check-out for all rooms. * Special rates have been arranged for this seminar. The casino, along with surrounding hotels and motels are charging up to 3X more otherwise. Prices are the same for single or double occupancy. The Inn is located 1 mile north of the casino, with a free round-trip shuttle bus service running to Turning Stone every 30 minutes. However, they will make special trips for 3 or more people at any given time. The Tower is on the resort premises and offers a few extra amenities. When booking, make sure to mention you are with the “Bujinkan Seminar”. It is advised to book your room as soon as possible. That particular weekend, hotels everywhere are accommodating a flux of guests for the multitude of college and university graduations occurring. We have blocked off a section of rooms for our seminar guests, but unreserved rooms will be released for general sale beginning April 9th, 2009. After that date availability can NOT be guaranteed, but the special pricing is contractually guaranteed. Insist on the seminar rate if anyone gives you a hard time. If there is a problem contact me immediately and I will handle it. My contact info is near the bottom of the page. Trust me, every hotel room in Central New York will be booked solid that weekend. No need to pay for it up front. Just reserve your room and hold it with your credit card. You will not be charged until check-in. You have up until 48 hours prior to check-in to cancel your reservation with no penalty. PARKING: Lot and Garage parking is free. Valet parking is free for overnight guests. Day guests may use valet parking for $5 per day. FOOD: There are many places to eat on the casino premises. Prices range from cheap and affordable sandwiches and pizzas to pricey high class restaurants. A list will be provided of suggested eateries at the seminar. Plenty of time will be allotted during breaks. Reservations for dinner at restaurants that particular weekend are encouraged ASAP. Remember, you can always cancel. NOTES: Please wear street clothes to and from the seminar and carry your uniforms and training gear in bags. The casino doesn’t want us spooking the other patrons. If you get lost in the casino, feel free to ask any employee or security guard for directions, that’s part of their job. It is also advised that you bring a set of “formal clothing” if you plan on eating at fine restaurants or attending any of the clubs and bars that have strict dress codes. Video taping is strictly prohibited and photographs require prior permission from Kacem. 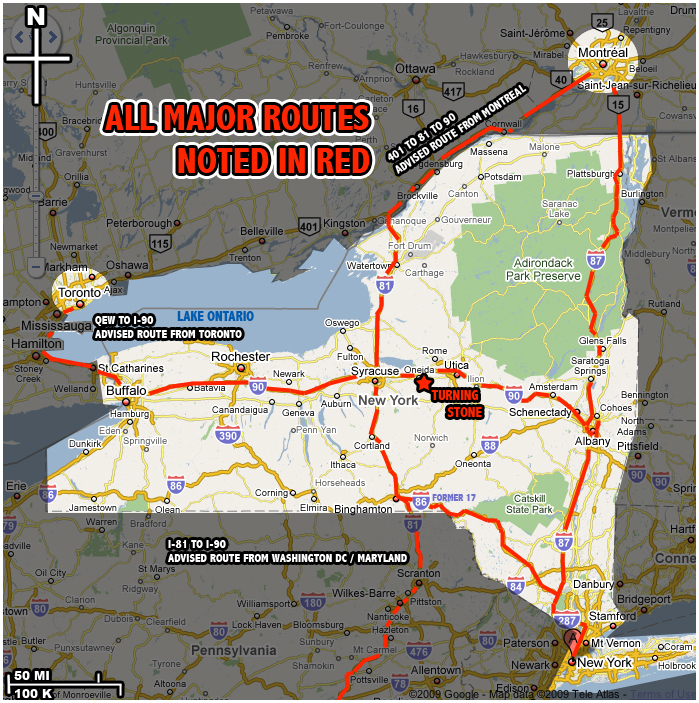 TRAVEL: Turning Stone Casino & Resort is located directly off NY State Thruway (I-90) Exit 33, in Verona NY. Just a 35 minute drive east of Syracuse, and only 4 hours from New York City, Montreal, Toronto, and Washington DC. Flights from these major cities into Syracuse are only 30-40 minutes. Airport pick-up can be arranged if needed. On a separate piece of paper or email, please include your name, email, phone, how many days you plan on attending, and which hotel you will be staying at. This will be kept for our reference and in case any necessary last minute information must be communicated. SPECIAL SESSION: We will have an extra private training session for a few hours with Kacem on Friday, May 8th at 6pm. Fee is $20. This is only available to people who will be attending the weekend’s seminar. It will be held at Spectrum Fitness on 554 S. First St., Fulton, NY, 13069. The seminar is limited to 50 participants and WILL fill up. BOOK SOON!